Pre-ICO and ICO in June!!! Bounty Program Has Started!!! You said something like "The AlphaCar will solve the lemon market problem existed in the automotive industry due to information asymmetry, which results in inferior players driving out superior players." Can you please elaborate on that? Thank you and good luck to the team. Imagine you are buying a used car. If you don't know the accident/maintenance/usage history of the car, your strategy would be make a lowball offer. So a well maintained car won't sell for a better price compared to a salvaged car. This has led to an inefficient market with high transaction costs. AlphaCar is honored to be invited to discuss the topic of auto industry + blockchain with blockchain experts and enthusiasts in the Wugu Blockchain Forum. On the night of May 25, a heavy rain is not enough to extinguish the heart of the blockchain and cryptocurrency enthusiasts. There is a full house on the spot and everyone waits for an exciting show. Wugu is a community centered on serving the blockchain industry. There are 25 founding members. Each event held by the forum focuses on blockchain technology and applications. Forum participants discussed the future industry layout of classic cars in the Chinese market. It shows that in both the used car and the classic car market, there are many pain points and problems that can be solved by the blockchain technology. In the future, the blockchain + classic car industry will record all classic car transactions in the market through blockchains, link the information,and conduct big data analysis, so that the majority of the classic car owners will enjoy trustworthy transparency and continuous optimization. The community of safe driving created and developed by Go2solution is being supported by new and valuable partnerships in order to make insurance smart and digitized. After several months of anticipation Go2solution announces strategic alliance with the AlphaCar project, acquiring the access to the Chinese automotive market — the largest market on global scale — in 2018 , but not in 2020 as expected earlier. Go2solution application is an innovative insurance solution on demand, which build the new stance of insurance from scratch. The mission of the application is to create the safe drivers’ community and promote the idea of safe driving culture in society. Belonging to Usage-based Insurance family, Go2solution app provides an individual approach to every customer, better risk management, improved fraud analysis, and overall safety of the driver. The participants of the community become the co-creators and regulators of the industry. 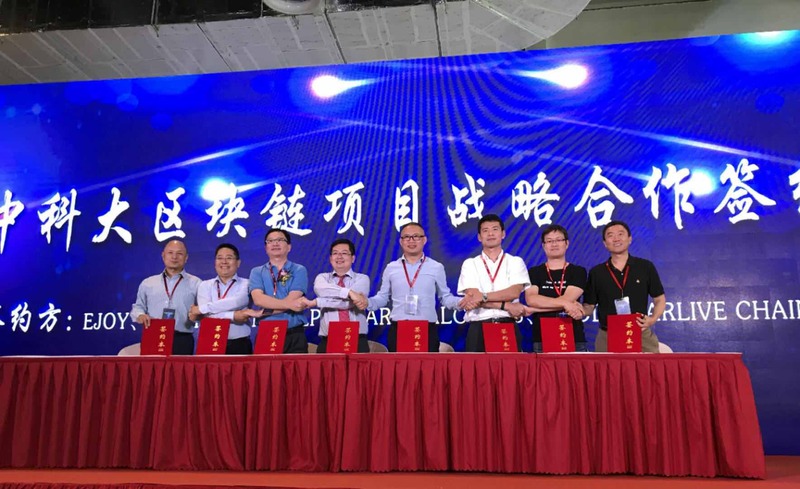 Go2solution planned to enter the Chinese automotive market in 2020. 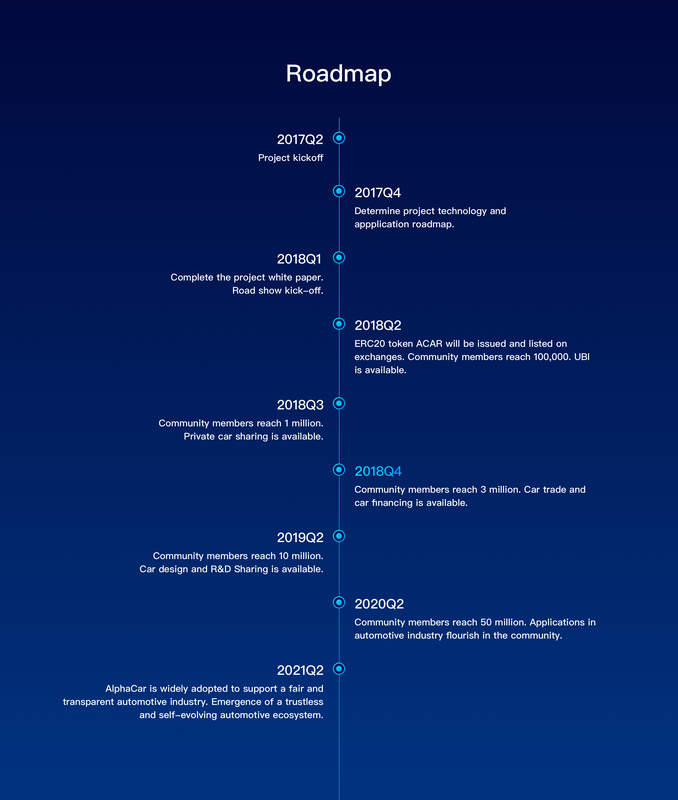 Thanks to strategic alliance with AlphaCar this plan is being fulfilled in 2018, as AlphaCar is a powerful and unique project, targeting to create 50 million community in next 3 years. AlphaCar project owes its quality to high-profile professionals that combine its team. Due to know-how exchange program the achievement of the goals is based on high-profile expertise of the powerful advisory team. 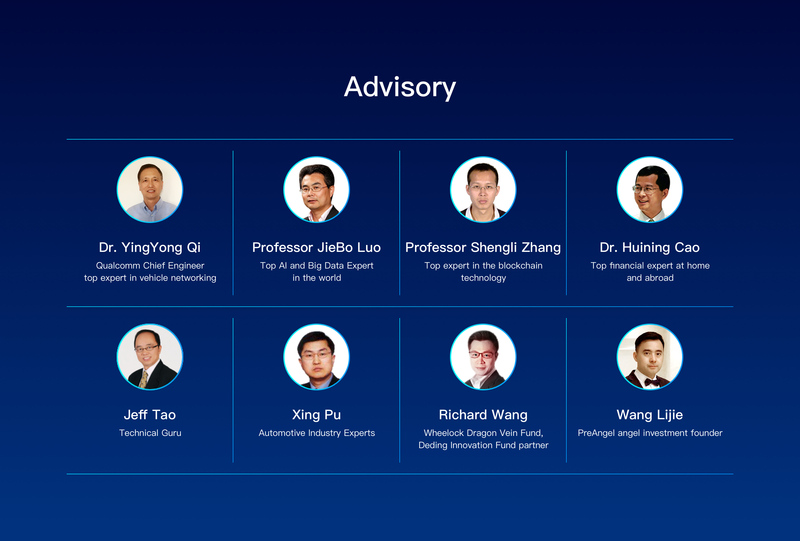 With over 20 years of the extensive experience on the Chinese automotive market, Go2solution is proud to collaborate with Professor Shengli Zhang, top expert in the blockchain technology, and Bill Deng, experienced entrepreneur in automotive industry. AlphaCar has developed the unique frame of reference, which encompasses the global automotive domain, and usage-based insurance is ranked first within their paradigm. The missions of Go2solution and AlphaCar are aligned and are looking in the same direction. AlphaCar seeks to create the community, which is why it has pinned high hopes on this collaboration. 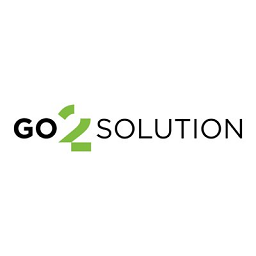 And Go2solution becomes the exclusive partner in the countries of the European Union. In less than three weeks Go2solution and AlphaCar will find themselves under one roof for joint meeting. The two projects will be discussing and elaborating on the strategic planning of the further campaign. Members of the press are cordially invited to the AlphaCar Product Release Press, which will be held in Shanghai Hongqiao Golf Club on Friday, June 8th. AlphaCar is expected to launch its mobile application APP and usage based auto insurance (UBI) product offering. 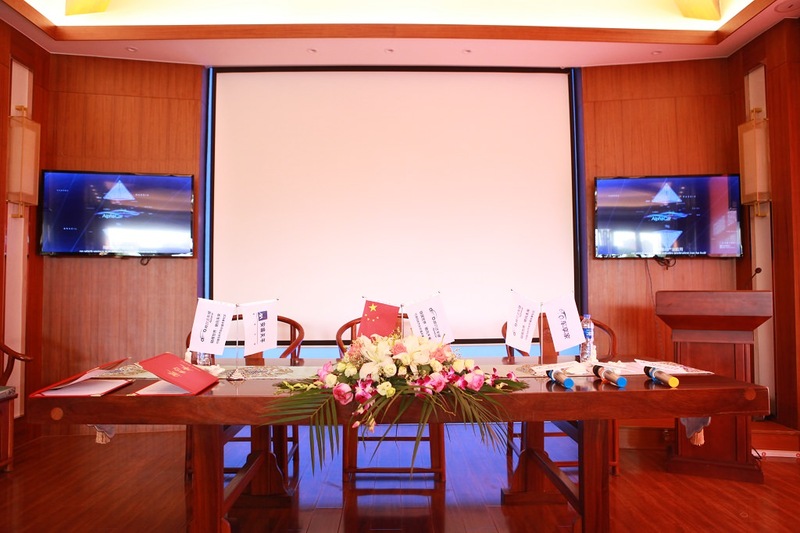 Also, a strategic alliance signing ceremony with AXA-TP insurance and Chexiang auto service chain will be held in the conference. AlphaCar is committed to building a community token economy (CTE) using blockchain and IoV technology. AXA-TP is the Chinese subsidiary of AXA, one of the largest multinational insurance and financial services group in the world. Chexiang is one of the largest auto online-to-offline(O2O) e-commerce platform in China, with over 1500 local service shops around the country. The press conference will be streamed live on the Yizhibo video platform channel ID 309567094, 2pm June 8th. How blockchain find reshaping car? I like the goal of AlphaCar to reshape auto industry. I'm sure many people including investors and bounty participants will join this project. But why the official site cannot be accessed? I want to see the more information there before, but cannot be accessed. Is it still in process? Hope it can be visited right away. 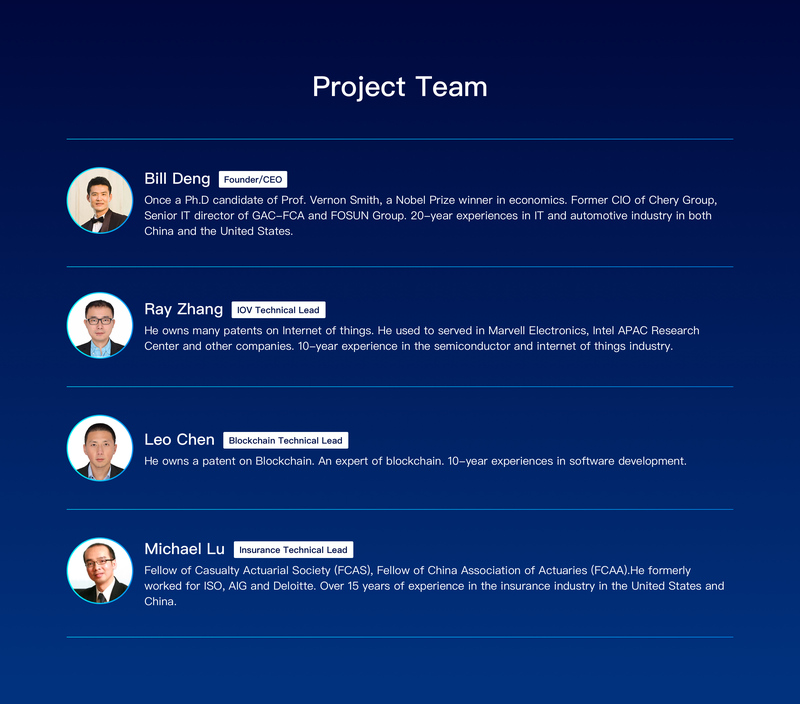 Excellent Project and Quality Team Members and Advisors. just one issue though if they want more inverstors maybe they should extend the ICO period.. The official AlphaCar project overview video has just been released on youtube at this link https://youtu.be/r1lF7R1rfNA (https://youtu.be/r1lF7R1rfNA). AlphaCar is committed to developing a Community Token Economy (CTE) for the global automotive industry. All of the automotive industry’s transactions can be recorded on the blockchain. Service providers and consumers will collectively build up a transparent token economy. Each member in the community can be rewarded with the ACAR token. 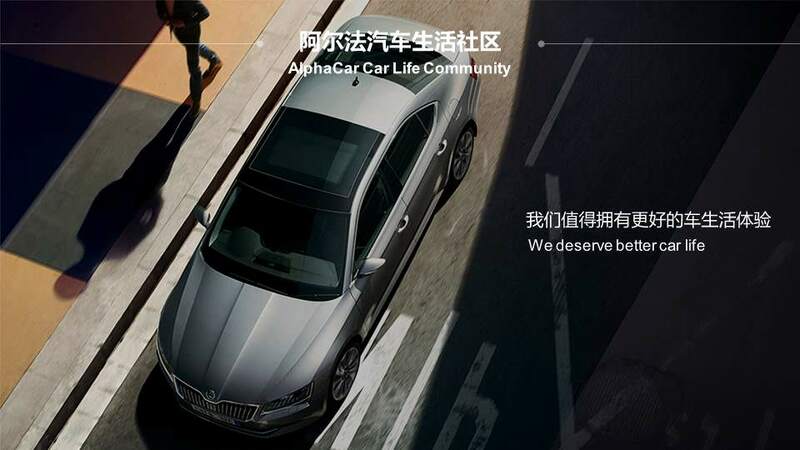 All the community members will enjoy a wide range of trustworthy services, such as shared car design, shared car R&D, private car sharing, usage based insurance, car maintenance and repair, car trade and car finance. The 10 trillion dollar global automotive industry will be transformed from a lemon market to a transparent and trustworthy market. 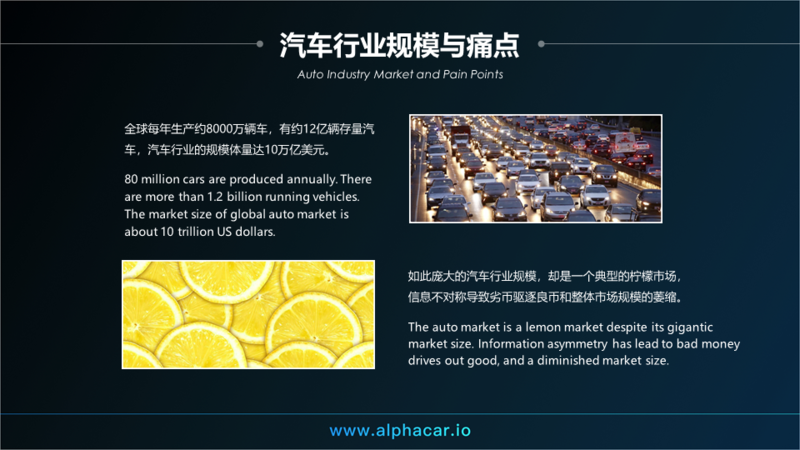 The auto industry is currently a lemon market, which means there are a lot of information asymmetry resulting in market inefficiency and high transaction cost. One notable example is used car trading. In many countries there are no public car history, leading to lots of problems and low resale value. AlphaCar is committed to work with trusted partners to make car records transparent and available to the public. There are other useful applications in auto insurance (UBI), car sharing, car repair and maintenance, car financing, etc. Where are you accessing from? The website works fine for most people, but we'll keep looking into this problem. Maybe you can try using a vpn/proxy. I adore the goal of AlphaCar to refresh auto industry. Good bounty program. But I wanna see the official site. Thanks for your suggestion. This round of sale will end on Jun 27. But we'll explore more ways for our users to invest in the project. Sure, Pls visit our official site at www.alphacar.io (http://www.alphacar.io) , Thanks! Indonesia. It may be caused by something wrong with the internet connection here (connection error). But it is fine, at least, I still can see some information from your ANN Thread. "pre-ico and ico will be from Jun 11 to Jun 27", Good news but it seems they will be held with a quite short time. AlphaCar Token Pre-Sale is Now Open !!! 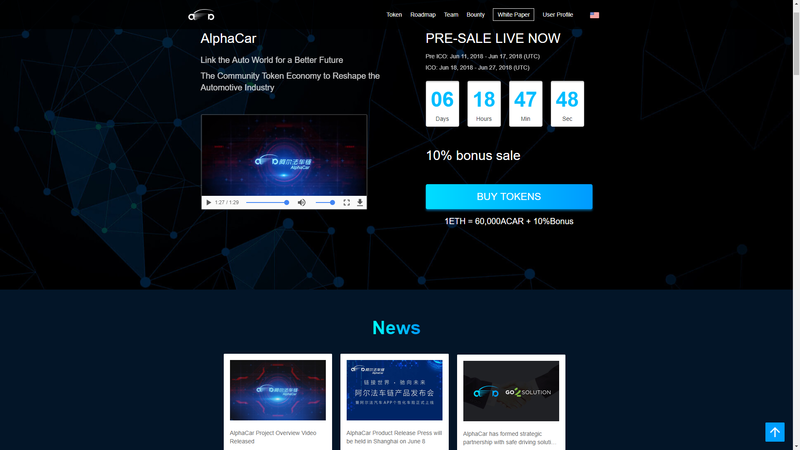 The AlphaCar token pre-sale is now open online at our official website https://www.AlphaCar.io (https://www.AlphaCar.io). The pre-sale has a 10% bonus and a one-month lockup. It will open until June 17th, 2018. Please join us to make the automotive world better! Press Conference — AlphaCar App and Usage Based Insurance Just Go Live!!! 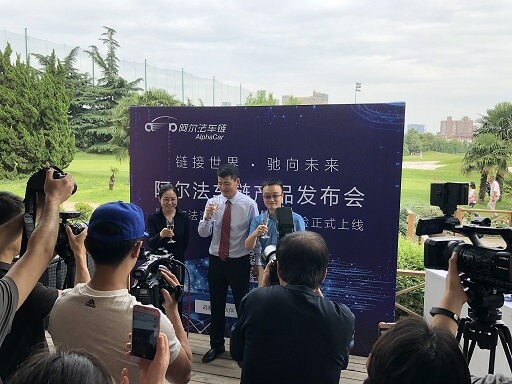 On June 8th, AlphaCar App Usage Based Insurance (UBI) official launch conference and strategic partner signing ceremony was held in Shanghai. 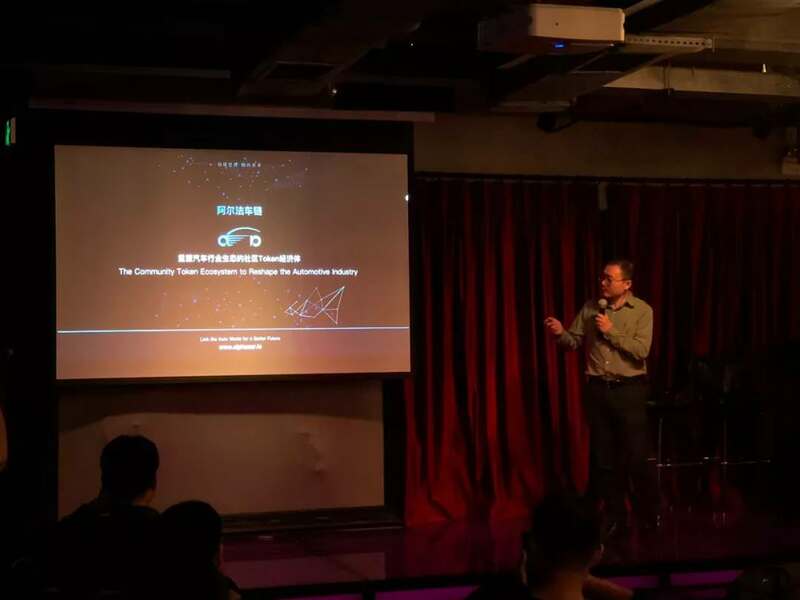 At the event, project founder Bill Deng delivered an exciting speech and shared the AlphaCar project with the guests present. 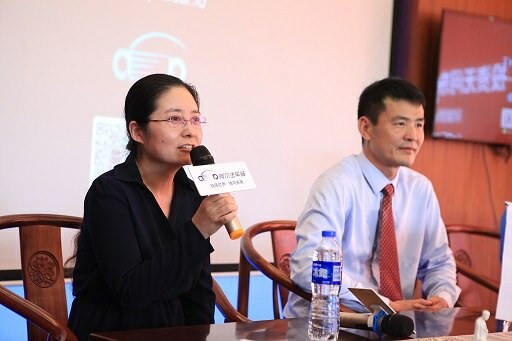 The honored guests from strategic partners CheXiang and AXA Tianping Insurance discussed topics such as blockchain, internet of vehicles (IOV), UBI and artificial intelligence. 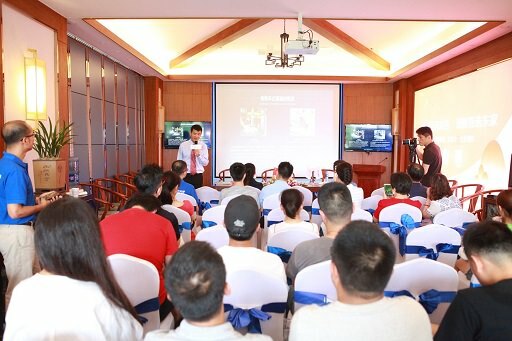 After the discussion, a signing ceremony of AlphaCar’s strategic partners was held, and the official launch of AlphaCar App and UBI program pushed the event to a climax. SHANGHAI, CHINA / ACCESSWIRE / June 7, 2018 / The global automotive market has more than 1.3 billion cars and is a 10 trillion US dollar market. However, it is a typical lemon market because of the asymmetric information problem. George A. Akerlof won the 2001 Nobel Prize in Economics for his paper published in 1970 "The Market for Lemons: Quality Uncertainty and the Market Mechanism". He used a used car market example to point out that asymmetric information will cause the bad money drive out the good and the whole market will shrink. Automotive consumers suffer from being surcharged by low-quality products and services. AlphaCar.IO will use blockchain technology to resolve this problem. By putting all transaction records on a public blockchain to make the records immutable, we will build a trustless automotive community. All contributors to the AlphaCar community will be reward with ACAR tokens, which will make consumers become stake owners. In today's corporate world, profit of a corporation could only be shared by shareholders of the corporation and has little to do with consumers. However, a corporation cannot be successful with its consumers and partners. In the AlphaCar CTE (Community Token Economy), the benefits of the CTE will be shared with consumers and partners. The AlphaCar CTE also follow the network effect, which means its value will be proportional with the square of its members. This paradigm shift will create an immense wealth creation effect, which is similar to the explosive energy created in a nuclear fusion. The earlier people or business join the CTE, the higher return they will get. 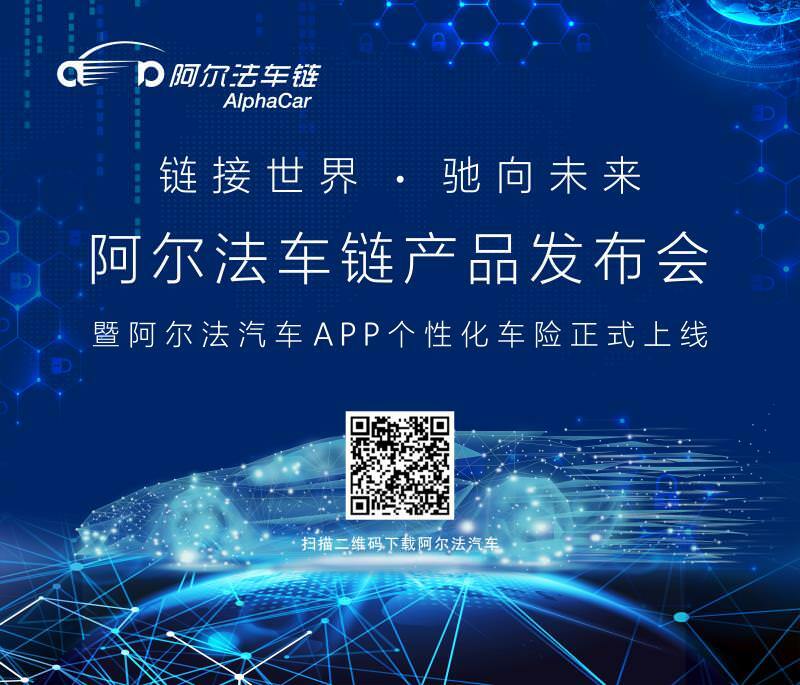 AlphaCar has built a strategic partnership with AXATP, the JV of AXA and will start providing UBI (Usage Based Insurance) to car owners in China by 6/8/2018. 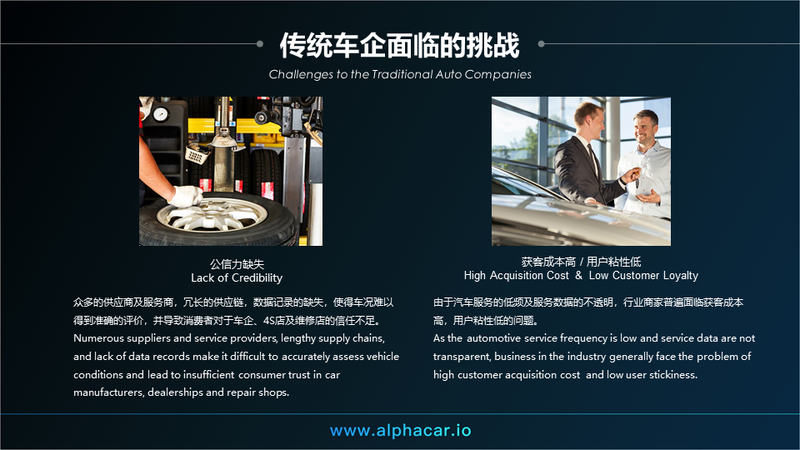 AlphaCar has also built a strategic partnership with CheXiang.com, the leading car service enterprises in China to provide one-stop car maintenance and repair service to car owners and reward them with ACAR tokens. 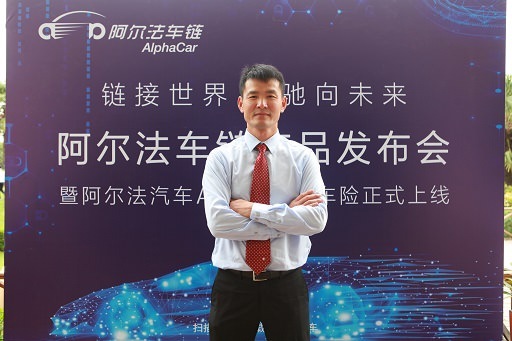 The founder and CEO of AlphaCar Bill Deng used to do his Ph.D. under Prof. Vernon Smith, 2002 Nobel Prize winner in Economics and father of Experimental Economics. Bill Deng has served as the CIO of top automotive enterprises such as Chery and GAC-FCA. The AlphaCar elite team members are from FCA, Intel, AIG, Deloitte etc. 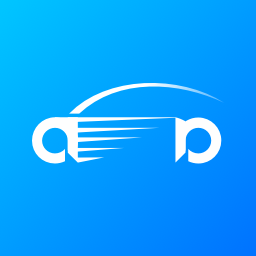 AlphaCar CTE will provide one-stop trustless services including CarDesign Sharing, R&D Sharing, Car Sharing, UBI, Car Trading, Car Maintenance and Repair, and CarFinancing around the world. We expect the total AlphaCar CTE members will grow to 50 million in two years. AlphaCar will build a CTE for the global automotive industry. In this CTE, consumers are also stake owners. The global automotive industry will be transformed from a typical lemon market to a 10 trillion dollar trustless market. This will result in an exponential decrease of transaction costs, and an exponential increase in efficiency. This paradigm shift will create an immense wealth creation effect. 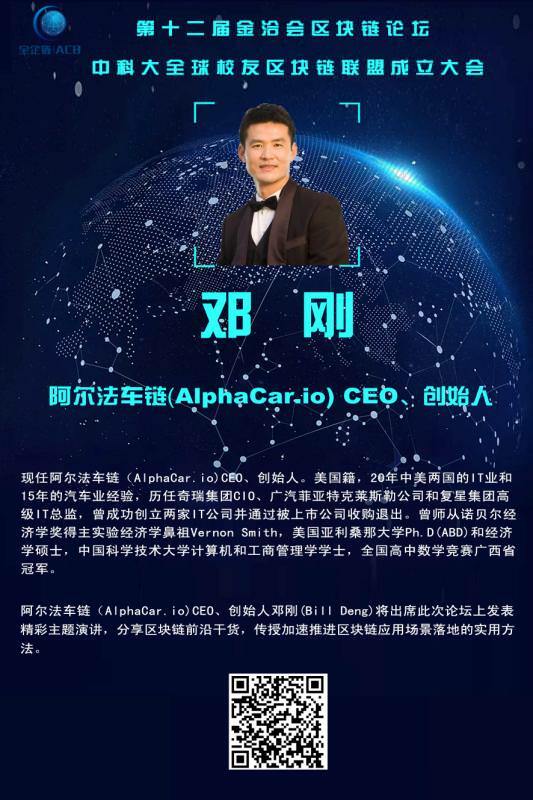 AlphaCar Founder & CEO Bill Deng is honored to be invited to give a talk at the famous Shanghai Financial Services Fair (“FS Fair”). 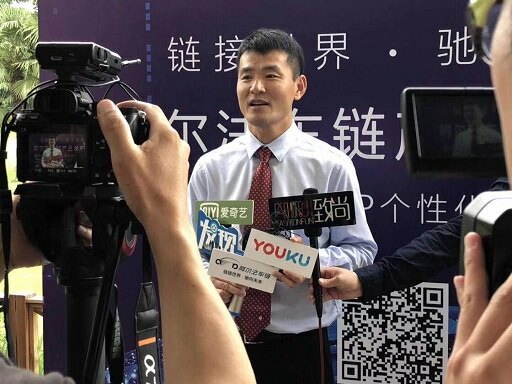 He will present at the blockchain forum of the fair, share frontier blockchain experiences, and introduce ways to accelerate the implementation of blockchain technology. The 12th Shanghai Financial Services Fair (referred to as “FS Fair”) will be held in Shanghai World Expo Exhibition and Convention Center between June 27 and 29, 2018. The fair covers an exhibiting area of nearly 10 thousand sq.m, and its scope of exhibits includes financial service institutions of banking, insurance, trust, securities, futures and funds, and sectors such as financial technology, capital market, cultural finance, regional featured finance and promotion of other provinces. 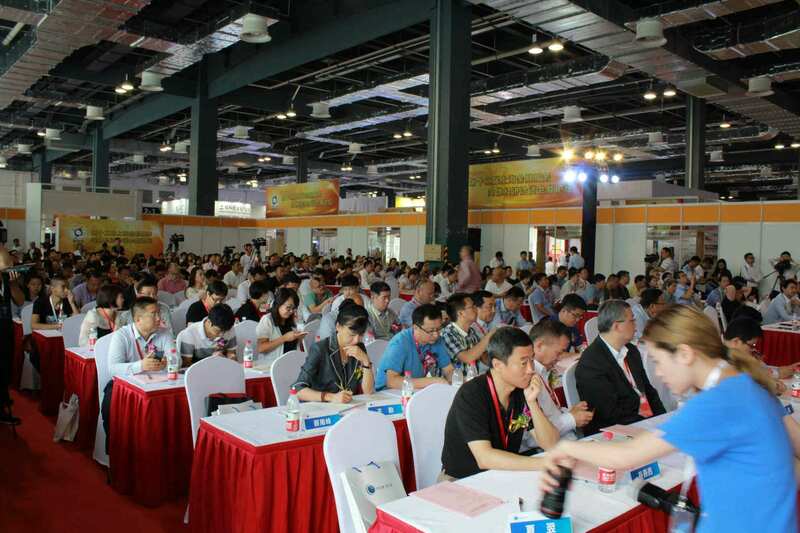 Over more than 10 years since its establishment, Shanghai “FS Fair” has always adhered to the purpose of serving the exhibitors and committed to building financing platform for financial service entity economy. Playing an active role in promoting economic development of Shanghai and its surrounding areas, the “FS Fair” is the famous brand exhibition of the largest scale in East China and with the most complete financial institutions. The last “FS Fair” was attended by over 170 exhibitors and nearly ten thousand professional audience, and 20% of the visiting agencies and the exhibiting financial institutions reached agreement on financing intention. A car project is great when things can be exchanged through Blockchain, transparently and without third parties. Your site is not working, I can not access. 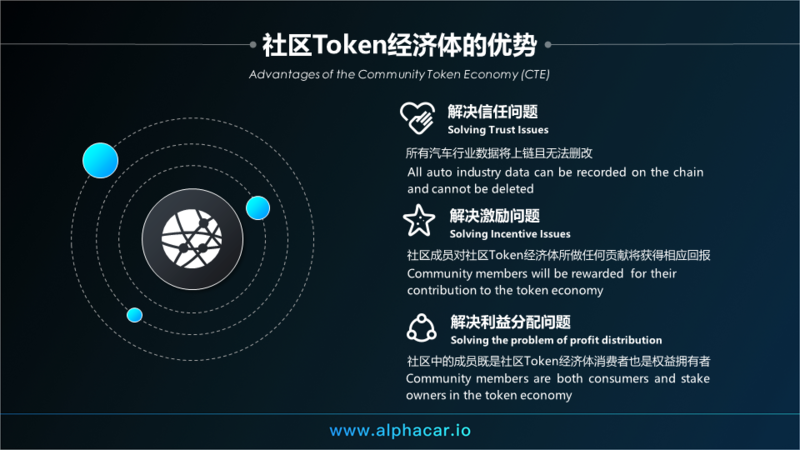 AlphaCar will build a CTE (Community Token Economy) for the global automotive industry. In this CTE, consumers are also stake owners and will eventrually own 80% of the total tokens. The value of the CTE will follow the netwok effect and will be in proportion to the square of community member numbers. The key data of CTE members will be stored on a public blockchain through a DApp (Decentralized Application). Batch and asynchronous processing technologies will be used to address the scalability problems of the current public blockchains, so as to support the high volume of a trillion dollar plus AlphaCar CTE in the future. Key transaction data produced in the automotive industry will be recorded on public blockchains. These transaction data will be analyzed by open AI algorithm voted and chosen by community members to provide rating and ranking, which will help to build a transparent and trustless CTE. Hi, where do you access from? We checked and it's working fine. Maybe try using a vpn? The WP of AlphaCar is really great! It's leagues ahead of anything similar to this project. Big data is important now! Good luck with the ICO, I think you should do well. The AlphaCar token is an utility token to be used within the AlphaCar CTE to purchase goods and services. All CTE contributors will be rewarded with tokens and middle man is no longer needed. The global automotive industry will be transformed from a typical lemon market to a 10 trillion dollar trustless market. This will result in an exponential decrease of transaction costs, and an exponential increase in efficiency.This paradigm shift will create an immense wealth creation effect, which is similar to the explosive energy created in a nuclear fusion. The earlier people or business join the CTE, the higher return they will get. Our goal is to make AlphaCar CTE valued at 1 trillion dollars in five to ten years. All consumer and business members of the CTE will be able to enjoy trustless services such as car design sharing, R&D sharing, car sharing, UBI（Usage Based Insurance）, car trading, car maintenance and repair, and car financing. UBI and private car sharing will be among the first round of services available to AlphaCar CTE members. Hi, Sir, Thank you for the blog and video. Please reply the bounty thread so that we can record stakes for you. 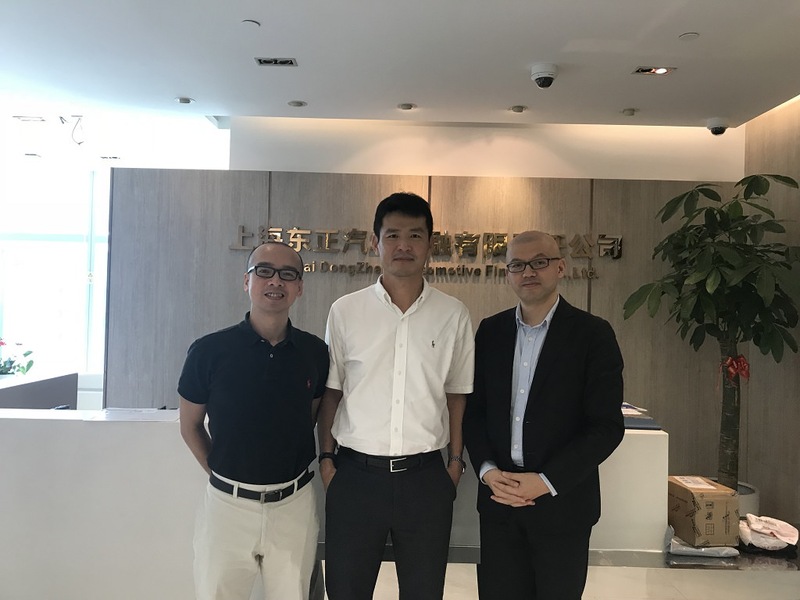 On June 26, 2018 Bill Deng, AlphaCar Founder and CEO, visited Mr. Wei Li, General Manager of DongZheng Auto Finance Corp (DongZheng AFC) to discuss cooperation opportunities. DongZheng AFC is the financial subsidiary of China ZhengTong Auto Services Holdings Limited (“ZhengTong Auto”), a leading Chinese 4S dealership group focused on dealership of luxury and ultra-luxury branded automobiles, and middle market brands. They enjoy 108 dealership outlets in operation in 36 cities across 15 provinces and municipalities. 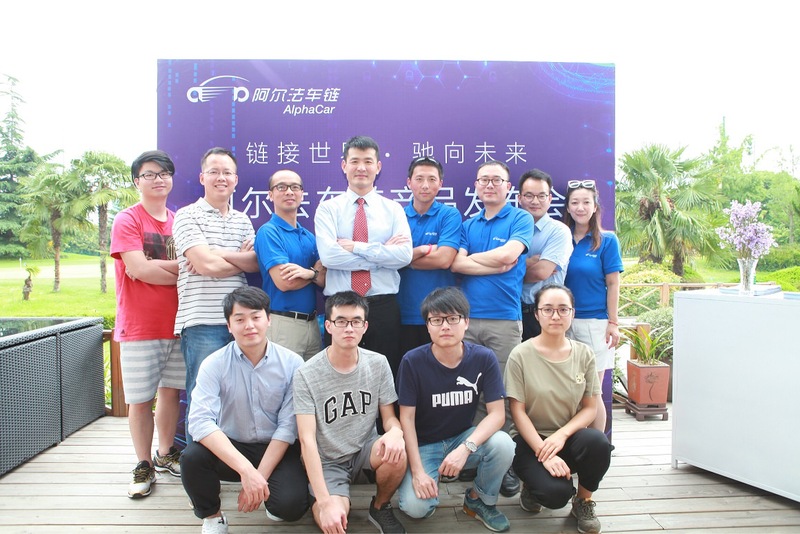 By implementing a carefully planned blockchain based strategy, AlphaCar can help its auto partners such as DongZheng AFC to broaden its customers reach, reduce credibility risks, and improve member loyalty. The traditional auto service providers can leverage the blockchain technology to quickly build up their competitive strength in the marketplace. The global auto industry is a gigantic market. 80 million cars are produced annually. There are more than 1.2 billion running vehicles. The market size of global auto market is about 10 trillion US dollars. However, the global automotive industry is in fact a lemon market. On one hand, there is no credible records for car production and service. On the other hand, the sophisticaiton and complexity of car make it very difficult for consumers to judge the quality and price. This has led to widespread bad money drives out good. The US government thus has implemented lemon laws to protect new car owners. However, almost all countries in the world are lack of consumer protection laws for the automotive market. There had also been a lack of technological solution for the lemon market problem, until the blockchain arrives. The arrival of blockchain and IoV technology will eliminate the lemon market caused by information asymmetry. This will greatly increase the transparency and market size of the automotive industry. Capitalizing on the disruptive blockchain technology, car consumers and comercial plaers will share the immense wealth generated from the paradigm shift in which a lemon market is tranformed into a trustless market. It is an exciting innovation by utilizing blockchain technology to bridge the classic car industry to perform large data analysis. this will certainly benefit the owners of classic cars will enjoy reliable transparency and sustainable optimization. Car aftermarket has entered trillion-scale volume. The blockchain can mainly help solve the problem of asymmetric information in the automotive aftermarket and the difficulty of the standard service system. The development of car networking is the basis for the transformation of blockchain to the automotive aftermarket. The combination of blockchain and car networking is currently the mainstream application direction in the car market, which changes the way in which data benefits are distributed. In January 2018, a number of cities in China lifted the implementation of the restriction policy on second-hand vehicles. The monthly transaction volume reached 1.184 million, an increase of 34.07% compared to the same period of last year. At present, the legitimate policies of the used car industry have continued to favor the recent catalysis, and the Ministry of Commerce stated that it will continue to promote the comprehensive elimination of the restriction policy on used cars. With the full implementation of the lifting of the relocation restriction policy, it is expected that the used car market in China will go hand in hand with the new car market and release a huge market potential. According to public information, the automotive aftermarket is the most stable source of profits in the entire automotive industry chain, accounting for about 60% of the total profits of the automotive market, while in the relatively mature market in the United States, this proportion has reached about 80%. In the era of China’s automobile entering inventory, the scale of the “trillion” of the after-market has taken shape. China’s car ownership has leapt to second place in the world, second only to the United States. According to data from the Traffic Management Department of the Ministry of Public Security, as of January 15, 2018, the nation’s car ownership amounted to 217 million, of which small and micro were registered in the name of the individual. The number of passenger cars is 170 million, and the current average age of our country is 4 years. According to China’s automobile circulation data, the scale of China’s auto aftermarket has already broken trillions of yuan in 2017. The automotive aftermarket is broadly defined as all products and services derived from the use of automobiles after they have been sold. It can be broadly divided into seven major industries: maintenance, repairs and accessories, used car sales and leasing, auto finance, and automobile insurance. Under the impetus of the technology of the Internet and car networking, the auto aftermarket will also make a positive contribution to the industry. Based on the Internet+, a group of automotive aftermarket + blockchain projects will emerge recently. It is intended to continue to optimize and reshape the service system. 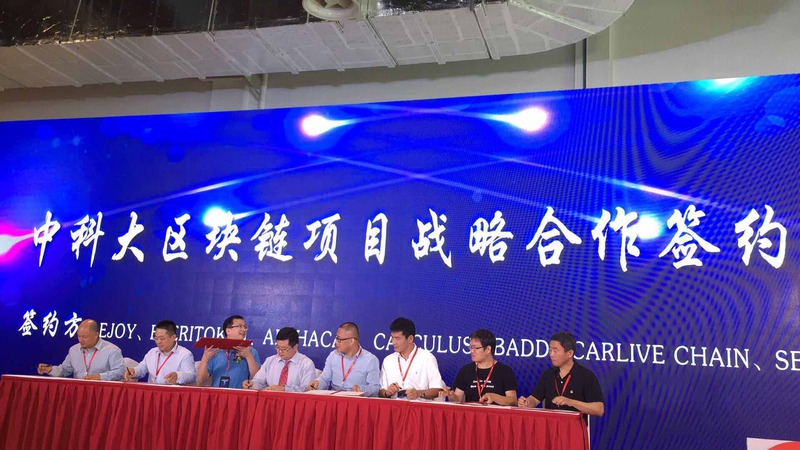 In March 2018, at the “2018 blockchain application remodeling automotive market after the summit”, the Ministry of Industry and the China Association of Electronic Commerce Automotive Industry Branch announced the “China Electronic Commerce Association Automobile Industry Branch Blockchain Industry Innovation Center (referred to as “The Blockchain Industry Innovation Center” was formally established. The blockchain can mainly help solve the difficulties of industry asymmetry and service system without standards. Although the development of the Internet and mobile Internet has improved some of the service deficiencies in the automotive aftermarket, it still has difficulties in various subdivided areas. The service providers and consumers have been struggling under the asymmetry of information, service pricing and quality without system standards. The complexity and professionalism of automotive aftermarket services have made it difficult for car owners to accurately assess the quality of service, which has resulted in the widespread use of bad coins to drive out good coins. The current blockchain technology may add another fire to its industry. In terms of overall car networking, behind the prosperity of the car networking market, there are hidden dangers — data security and sustainability. Application of blockchain technology can better solve data security problems and make vehicles The establishment of low-cost direct communication bridges with other nodes in the car network, together with the token economy system, makes data security, efficiency, and transactions become interlocking and smooth. In terms of vehicle maintenance and accessories, block chain technology can theoretically accurately record the supply chain information of each part and provide safe and reliable auto parts products for auto manufacturers, auto service providers, 4S stores and consumers. Counterfeit parts increase brand loyalty at the consumer end, combined with IoT technology, can reduce recall costs when repairing, and automakers do not have to recall entire vehicles. In the case of used cars, second-hand car transactions require an accurate assessment of the vehicle, and the remaining value of the vehicle is judged by grasping the terms and conditions of use of the car and the condition of the car’s wear. Blockchain technology enables all vehicle nodes to publicly record the vehicle’s life operation data, as well as buyers and sellers, brokers’ information, to some extent to curb fraud and achieve fair trade. In terms of insurance, the standard process of digitalization after car networking can be handled through smart contracts, such as buying insurance and claims processes, and parts identification that can be identified online. However, in the actual scenario of the claims process, many are required to be artificial. The identification, therefore, the role of the blockchain is more on the update and transparency of the operating system, through the accumulation of data and then better derivative services, there is still the problem of mutual distrust between insurance service providers and car owners. In general, the main role of blockchain technology in the automotive aftermarket is to obtain more transparent data, make industry information more symmetrical, reduce unnecessary middle parties, and improve service efficiency. The key point here is grafting on the Internet of Vehicles to expand more service space and better service quality. 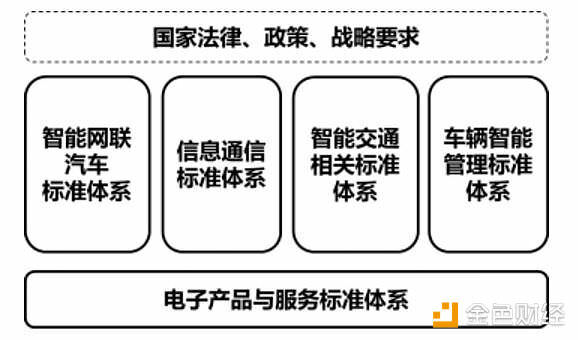 On June 15, 2018, the Ministry of Industry and Information Technology and the National Standards Commission jointly issued the “Guideline for the Construction of the National Vehicle Interconnection Industry Standard System (General Requirements)”, which was issued in December last year as a guide to the development of the National Vehicle Interconnection Industry Standard System (Intelligent Network Alliance Automotive). Another important policy guide after ). It is pointed out that by 2020, we will basically build a national automobile networking industry standard system, promote the acceleration of the development of new technologies and new services such as autopilot, and foster new economic development momentum. The arrival of 5G can promote the unification of car networking standards. As a communication application with high requirements on the stability, timeliness, and high bandwidth of communication, Vehicular Communications has always been subject to various factors such as the inconsistency of communications standards and the physical limitations of communications standards established for human-to-human communications. develop slowly. In the formulation of the 5G standard, car networking is regarded as one of the important usage scenarios. The 5G network can meet the specific high requirements of network performance through key technologies such as network segmentation and other innovative technologies. By the way, China Mobile has announced its 5G terminal route and will launch a universal module at the end of this year. The Beidou system will also help the popularization of cart-based networking applications. Car networking requires high precision for navigation and positioning. The Beidou system is China’s autonomously controllable satellite navigation system. With the technology of ground reinforcement and other technologies, the Beidou system will have more potential for application in vehicle navigation and positioning. The blockchain and car networking technologies are both in the rising exploratory period, both in terms of technology or standardization and commercialization, and the integration of the two will accelerate the development of the entire automotive industry. Currently, in the area of ​​automotive aftermarket, companies are exploring Focus on this. The combination of blockchain and car networking is the current mainstream application direction, which changes the way of distributing data benefits. On May 1, 2018, the world’s four largest automakers (BMW, Ford, General Motors, and Renault) have teamed up with technology vendors (Accenture, IBM, etc.) and start-up companies to establish the largest blockchain in the industry. The Alliance “MOBI”, MOBI’s goal is to create common standards and APIs to enable payment and data sharing between cars. These services are designed to promote the new digital mobile ecosystem — from shared cars to driverless cars. Currently, IBM has provided a solution for vehicles that support blockchain-related software, which contains immutable information from code development from requirements to development and testing to post-production, allowing automakers to track every line of code in the car. The source provides transparency and trust for all parties. Car dealers and service providers can use this information to find out more easily the source of the problem. U.S. mobile operator Sprint partnered with blockchain startup NXM to launch a blockchain IoT automotive platform. The platform incorporates high-speed passenger Wi-Fi with advanced vehicle health monitoring and security features, including a blockchain-driven IoT security system to prevent hacking. It will provide customers with services such as in-vehicle 5G Wi-Fi, vehicle maintenance monitoring, dispatching, and collision detection. The main highlights are securing the safety of vehicle users and reducing the cost of communication with external services. Two weeks after MOBI was established, Carblock joined. CarBlock was founded in Silicon Valley in August last year. It is a car-networking system project based on blockchain technology that protects data privacy. It combines intelligent hardware to collect data to solve the biggest pain point of the development of the car networking industry. The data has no privacy and low utilization. Its advantage is that its founder has already made a company nonda in the field of automotive hardware, and the new project can naturally acquire accumulated customer resources. CarBlock is an online data marketplace where you can buy and sell data and buy and sell services. Through blockchain technology, vehicle-related data is owned by vehicle owners. Car manufacturers, insurance organizations and other service providers want data and can purchase from owners, and then use data legally and efficiently to create more innovative and personalized products and services. Provided to the owner. In early May, National Grid Group, the big data operator of the Internet, announced that it had entered the blockchain. The OBD (Onboard Diagnostic System) box launched by its National Chebo Platform is an OBD product that mainly uses car big data combined with blockchain application properties to promote green travel and low-carbon travel. The data of driving distance, driving time, fuel consumption, and three-level driving behavior of platform owners are analyzed into data package products, and platform owners use outsourcing sales to enable each owner to receive rewards for driving income. 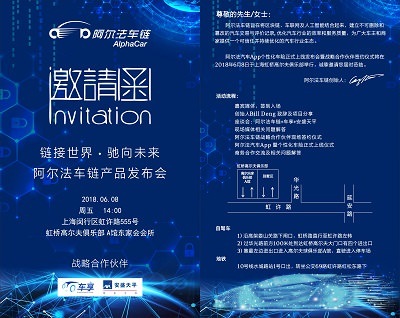 Another car networking big data operator “driving plans” has also entered the application of car networking + blockchain, and the temporary model is similar. The founder of the AlphaCar is the CIO of the former GAC Fiat Chrysler. AlphaCar hopes to build a weakly-centralised community that serves global owners, builds AlphaCar community to create a post-market ecology, and enables owners to enjoy auto insurance (self-employed). One-stop continuous optimization of post-market services such as private car sharing, used car sales, car loans, and vehicle maintenance. 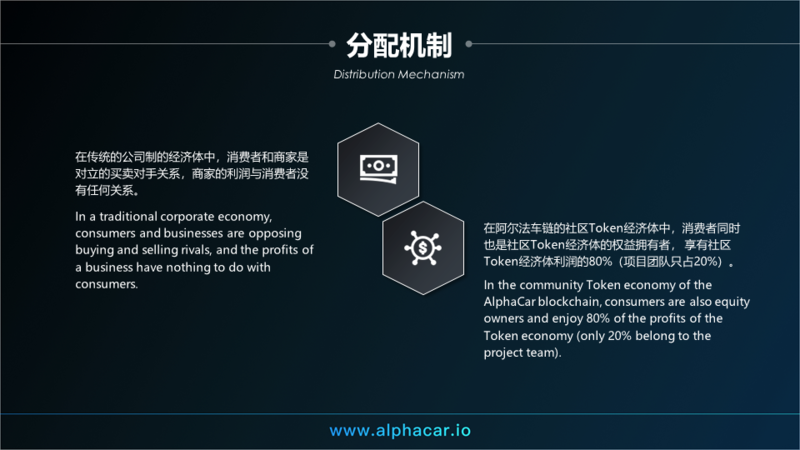 Taking AlphaCar community as the practical application scenario, combining OBD with blockchain technology, using token economy + mining concepts to optimize the industry service system and the channel for passengers, to provide owners with optimized full-automotive aftermarket services. In addition, both the HJIG chain platform and the vehicle chain are trying to become an integrated service platform, combining multiple parties in automobile manufacturers, auto parts manufacturers, distributors, maintenance services, maintenance services, insurance companies, banks, and other industrial chains. 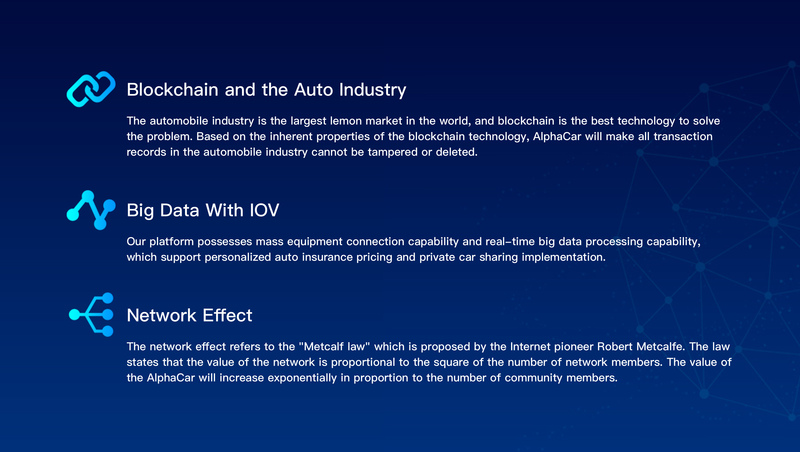 Chain consensus mechanism, smart contracts, multi-signature wallet technology, etc., to solve the problems of current information asymmetry and credit risk in the automotive market. SIGMA intends to build an intelligent transportation platform based on blockchain technology, combined with electronic license plates. The electronic license plate with custom chips is used as the unique account number and logo of the car to access the blockchain system; electronic license plates and long-distance scanning technologies that the user can pass through are combined with the terminal app to realize various daily payment and inquiries for vehicles. At the same time, the traffic control department of public security inquiries and manages the corresponding information of all vehicles by accessing the blockchain. Currently, there is no large-scale and industrialization in the post-market with a tera-scale mass volume, and there is no leading company with a relatively high market share in the industry. Blockchain technology will bring more benefits to the industry’s head enterprises and promote the construction of a standards system. For start-ups, they can have advantages by addressing the specific vertical pain points and optimizing services. 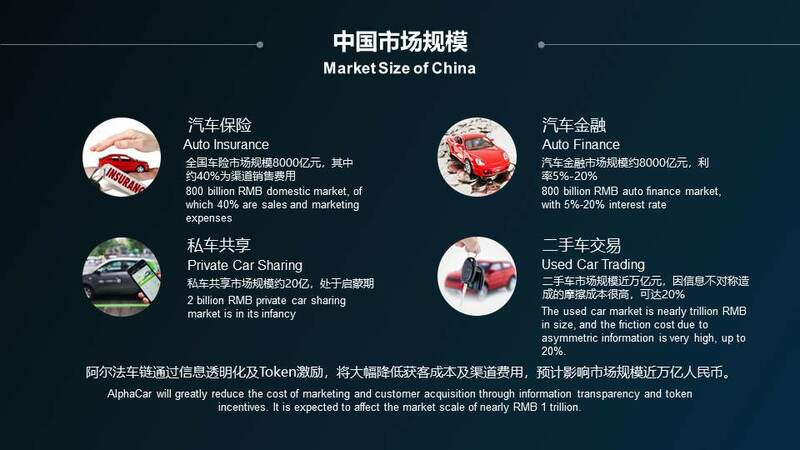 However, the Internetization of the auto market has only started for more than five or six years, and the online business is still in the development stage. In the automotive aftermarket, the online behavior of cars (ie, car networking) collects massive amounts of data, and accurate analysis is the key. Blockchains must be based on a more complete digitization of their businesses to bring about fuller benefits. .
AlphaCar is honored to participate in the famous Shanghai Financial Services Fair (“FS Fair”) on June 28, 2018, held in the Shanghai World Expo Exhibition and Convention Center. 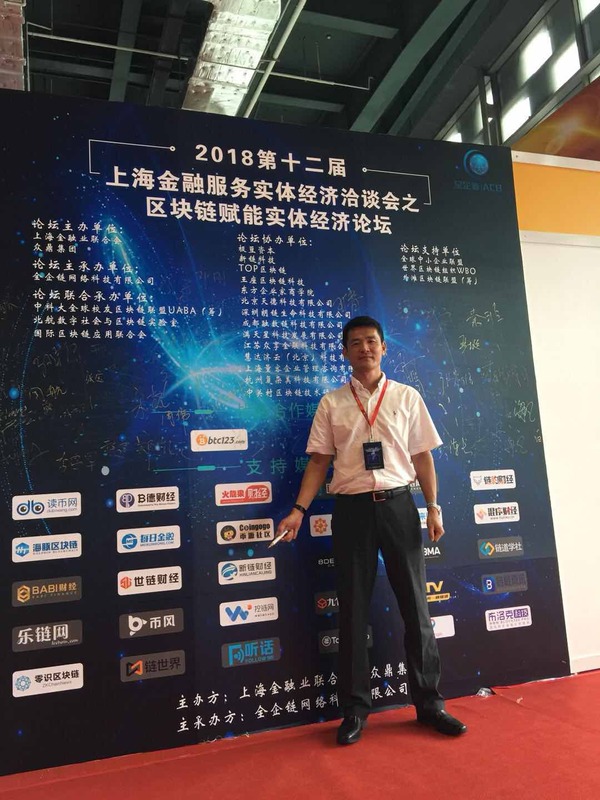 Bill Deng, AlphaCar Founder and CEO, presented at the blockchain forum of the fair, shared frontier blockchain experiences, and introduced ways to accelerate the implementation of blockchain technology. 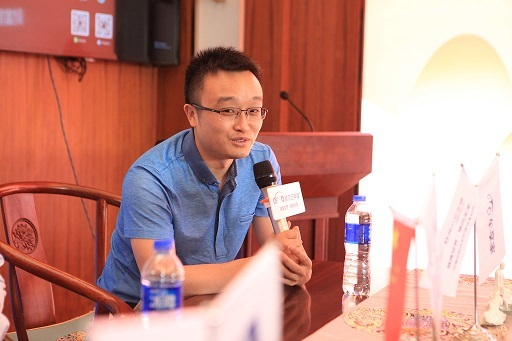 In the FS Fair, the University of Science and Technology of China Alumni Blockchain Association (UABA) alliance was formed to promote stronger blockchain engagements. USTC is one of the top universities in China and supplies the majority of talents for the Chinese blockchain industry. Many key team members of AlphaCar are from USTC. Firms from Shanghai, Beijing, Silicon Valley, New York, Japan and Singapore joined the alliance. 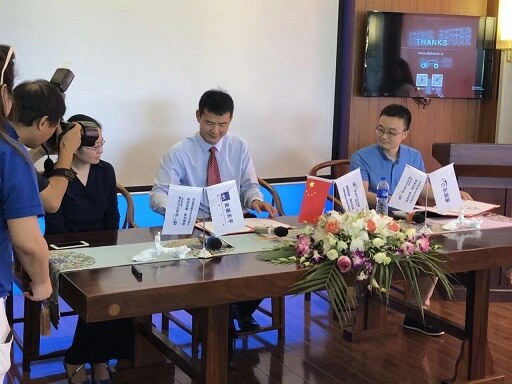 On June 28th, the first global alumni blockchain association, University of Science and Technology of China Alumni Blockchain Association, was established in Shangha, China. More than 300 delegates from over 20 locations including Sillicaon Valley, New York, Tokyo, Shanghai, Guangzhou, Beijing, and Shenzhen attended the conference ceremony. 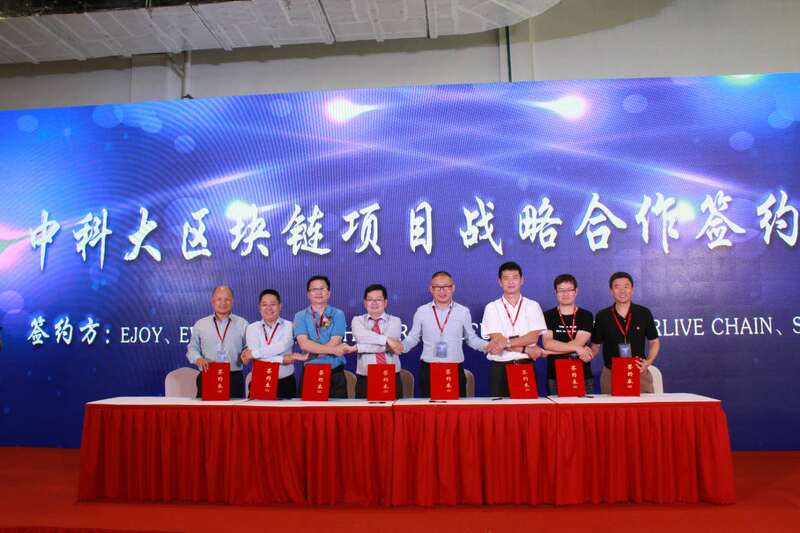 On the first day of its establishment, multiple USTC alumni blockchain projects including EJOY, everiToken, IOV/CarLive chain, Calculas, BADD, AlphaCar, SECBIT, and DAEX signed strategic partnership agreement, with a total market cap over 12.8 billion CNY. 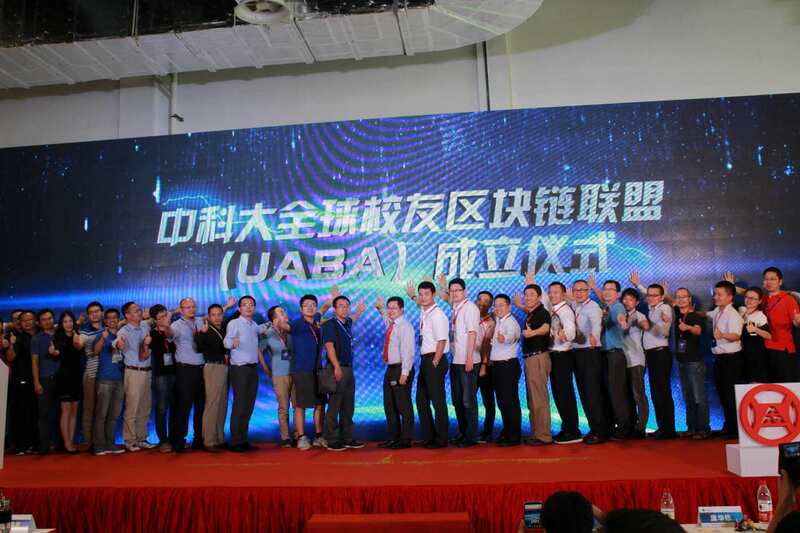 UABA was formed to promote the blockchain technology creative development and application. It is a non-exclusive, open non-profit innovation organization that complies with laws and regulations, protects fairness, justice, and sustainable development. Excuse me, can anyone access the AlphaCar website? I've tried it several times but i can't access it, it always showing an error message. There are a couple key challenges to the traditional auto companies. First, lack of credibility. Numerous suppliers and service providers, lengthy supply chains, and lack of data records make it difficult to accurately assess vehicle conditions and lead to insufficient consumer trust in car manufacturers, dealerships and repair shops. Second, high acquisition cost & low customer loyalty. As the automotive service frequency is low and service data are not transparent, business in the industry generally face the problem of high customer acquisition cost and low user stickiness. Stay tuned for how AlphaCar can help business partners resolve these issues. Hi, the website is working fine. Where do you access from? Maybe try using a vpn? AlphaCar provides three major solutions to the current automotive market. First, AlphaCar helps to solve trust issues. Auto industry data will be recorded on the public blockchain and cannot be deleted. Second, AlphaCar helps to solve incentive issues. Community members will be rewarded for their contribution to the token economy. Third, AlphaCar helps to solve the problem of profit distribution. Community members are both consumers and stake owners in the token economy. In a traditional corporate economy, consumers and businesses are opposing buying and selling rivals, and the profits of a business have nothing to do with consumers. 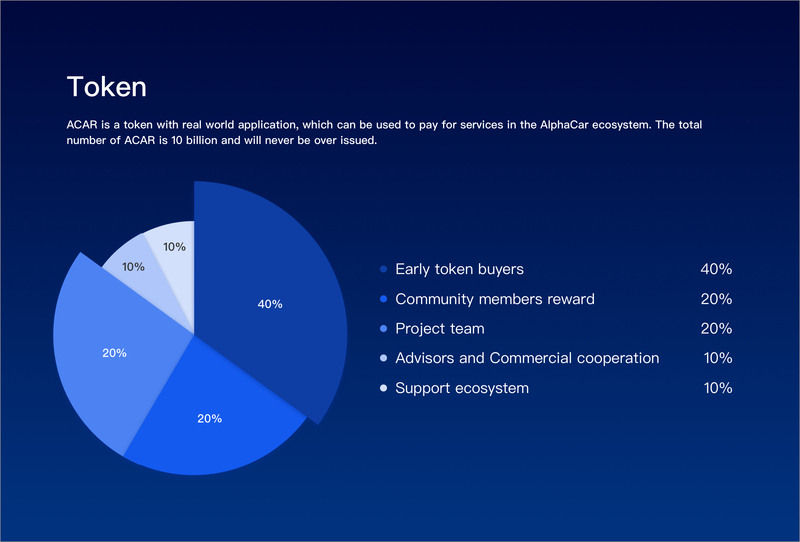 In the community Token economy of the AlphaCar blockchain, consumers are also equity owners and enjoy 80% of the profits of the Token economy (only 20% belong to the project team). I interesting this project, i hope succes till the end ico. Very interesting! I love the development of automotive industry these days that's why I'm here! What's the main feature against traditional car sharing platforms?? The AlphaCar community follows the network effect. Its value is proportional to the square of the number of community members. This ever-increasing positive feedback mechanism will bring about rapid growth in the size of the community. The paradigm shift process in this industry economy will have a huge wealth spillover effect, similar to the huge energy release during nuclear fusion. The earlier people join and contribute to AlphaCar, the higher returns they receive, similar to the huge rewards that come with Bitcoin and Ethereum early participants. I think this is very interesting and a good project, yes many of us buy all these used cars without getting the proper info on the car regarding its accident/maintenance/usage history, this will definitely help in cubing that issue. Good luck on this. The AlphaCar community is the essense of the AlphaCar Community Token Economy(CTE). The users are also stakeholders of the CTE. Supporting the community is the AlphaCar data platform, which leverage IoV technology to provide insights into the service offerings that community members will enjoy. The infrastructure supporting the CTE is the public blockchain and IPFS storage. The open platform also supports blockchain explorer and other DApps. When people join the AlphaCar community, they will be rewarded with ACAR. The ACAR they earn can be used to purchase various products and services in the ecosystem. Users automotive data and information can be recorded on the blockchain to increase vehicle information transparency. As the community grow, ACAR will appreciate in value and community members will enjoy tremedous value appreciation. This will lead us to a better car life. 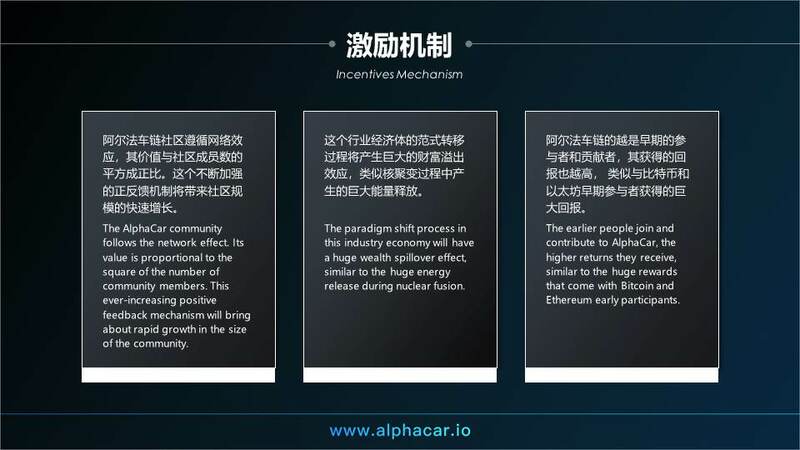 AlphaCar will greatly reduce the cost of marketing and customer acquisition through information transparency and token incentives. It is expected to affect the market scale of nearly RMB 1 trillion. From what i understand on the concept of AlphaCar, with the utilization of AlphaCar, i think it would also able to protect any thieving since all the car that has been sold has a solid data that are easily track able. This will also able to help the country to manage any tax of the car. 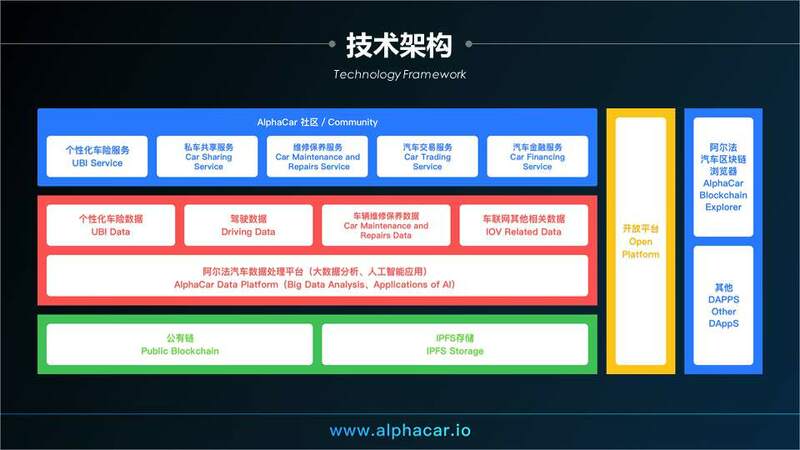 For large data storage, AlphaCar uses IOV to have massive device connection capabilities and real-time data processing capabilities, which support private car insurance pricing and private car sharing implementations. AlphaCar is planning to offer rideshare services in late August or early September. By using the new version of the AlphaCar app, non-commercial drivers can pickup passengers who share a similar route, while sharing the travel cost. The passenger will pay 50–70% less than hiring a taxi or Uber/Didi driver. Both the driver and the passenger will receive ACAR token rewards. Rideshare is a huge market globally but is also underserved. One reason is that the supply of vehicles and drivers are relatively few and cannot meet the travel demand. By granting proper incentives to the drivers, AlphaCar aims to encourage more car owners to become rideshare convenience providers, and subsequently reduce the travel cost and alleviate traffic congestion problems. Mr. Gerald is right. besides, this platform uses blockchain technology that allows all transaction records in the car industry to not be damaged or deleted. According to a Roland Berger study, rideshare has great development prospects in China. It is expected that in 2018, from a national perspective, rideshare will continue to be a blue ocean market, and the overall supply is difficult to meet demand. The rideshare market direct travel demand will increase rapidly from 8.16 million trips per day in 2015 up to 37 million trips per day in 2018. 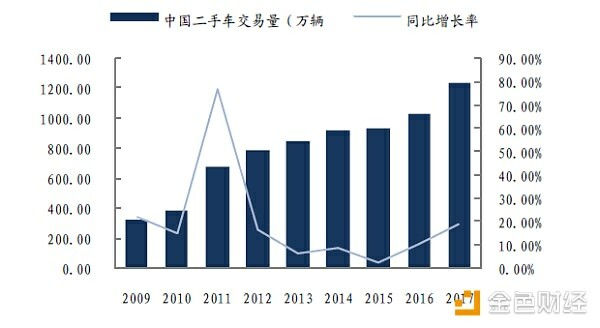 Correspondingly, the market size will increase from 66 billion RMB per year to 380 billion RMB per year. 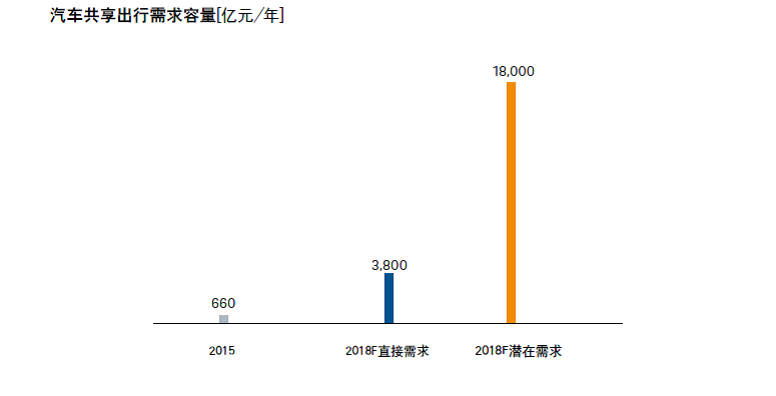 Further considering the potential replacement possibilities for rideshare to other modes of travel, Roland Berger predicts that the potential demand for rideshare is expected to reach 160 million trips per day in 2018, corresponding to a potential market capacity of 1.8 trillion RMB. The demand outlook is very broad. 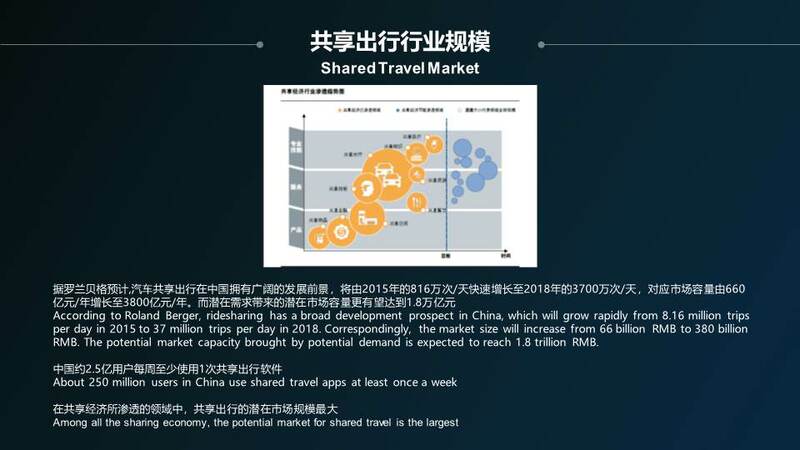 From the comparison of supply and demand in the rideshare market, the demand of users is far greater than the actual supply of the market, and the development potential for enterprises is huge. 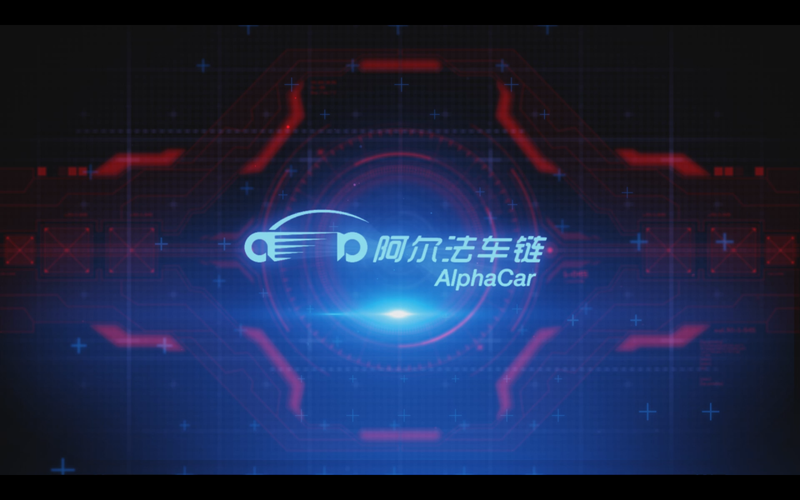 In view of this, AlphaCar aims to enter the China rideshare market, and subsequently become a major rideshare service provider worldwide. I believe that it is worth supporting this project because the Sun money Coin team and absolutely all members of the company are working for the benefit of the company and are always ready to help in any matter. seems like a promosing project. will keep paying attention on you. hope you could bring more interesting activities for us. 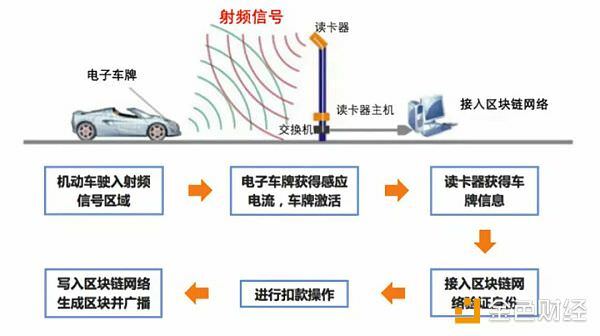 In order to protect the safety of the passengers, the IoV system will automatically configure the GEO electronic proximity of the expected route, and will analyze the status of the car, the condition of the traffic and the driving route in real time. If the car is in bad condition or on an incorrect road, the remote operator will give you a clue. We believe that car sharing, especially when autonomous driving is mature, is the ultimate form of public transport. Cars managed via the trusted network of the AlphaCar chain can automatically drive to the point of use when needed by the passengers and automatically drive to the nearest car park upon arrival, saving road congestion and parking time. In the overall service process, the car's position is effectively managed. In order to protect passengers' safety, IoVsystem will automatically set up the electronic GEO fence of the expected route, and analyze the car condition, traffic condition and driving route in real time. Love this project and also the experienced team behind it! I have a question about the Referral Bounty campaign. Is there a cap? If the car is in abnormal condition or wrong road, it will give the remote opearator a hint; It can also give passengers a warning and protection if they find the potential danger. By the car intelligent hardware, and APP, private cars can easily join the IoV system, the safety of idle cars can be automatically and reliably check. When a car owner contributes a private car to a sharing service provider,he can obtain the rental income of idle assets, while the AlphaCar has a reliable record of the car's health status and usage. I received around 3k ACAR tokens today and was wondering where I could buy more. I know there are ten billion of them so it would be nice to be able to get a few more as I like the fact that we will earn dividends. Also, where will I need to hold them to earn the dividends as I saw that we will get them in RENMINBI? Or will we receive them in ACAR? I was a bit confused with that and also wanted to as will it go first on Chinese exchanges before we see it on other ones? I am curious where it will go first. I am excited to see this project work. when will this token be on an exchange, does Tim still wait for the market to return to normal, or there are still no plans to do so? I think this is a dead project. There is no information from the project development team.